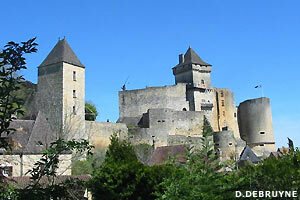 Perched with hillside on left bank of the Dordogne, Castelnaud dominates the small borough coiled with its feet. Its former owners, vassal of kings of England, opposed a long time to their neighbors, the lords de Beynac, faithful to kings de France. If the protagonists of these remote quarrels have all disappeared, the two fortresses always continue their immutable face to face, like a mineral challenge with the lapse of memory and the ravages of time.